Recently, Kangana Ranaut stated that the industry has been making her feel alienated and many of the Bollywood biggies are ganging up against her. 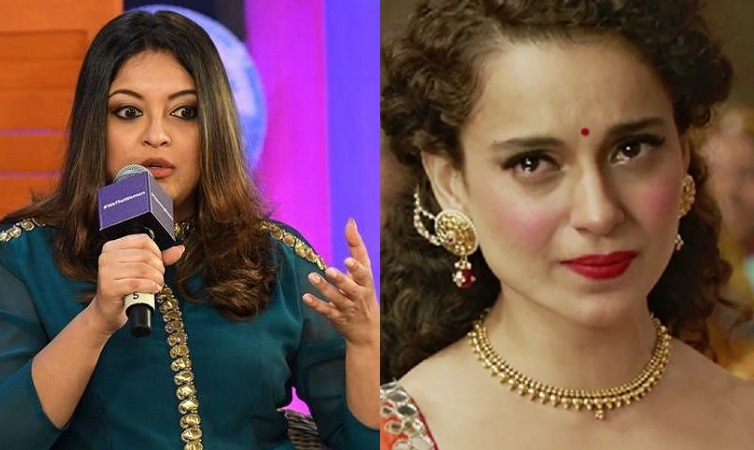 To this, actress Tanushree Dutta, has come out in support of the Manikarnika actress and has penned down an open letter to her. "Kangana Ranaut is a bonafide A++ list Actress. Why the extra plus because she is the only one who made it to the top of her game in Bollywood without the nagging support and recommendation of A- list male stars, without a high profile surname or an unrealistically perfect, pure and pious facade that most Bollywood actresses seem to wear on and off screen. Besides being a powerhouse performer she has truly set an example of someone who has made a unique and celebrated place for herself in an industry tough to conquer for an outsider. This Damsel has truly made it all the way despite all the distress; leaving the frat boys club of Bollywood and their dames twiddling their thumbs in abject contempt for her success. Kangana they don't support you because they are intimidated by your talent, they hate your guts and their brawny thick muscle brains can't seem to figure out for the love of sweet bejesus how on earth you made it this far without them!! They think they are Gods and its blasphemy to acknowledge that you shouldered a multimillion-dollar film on your own. With Manikarnika's success, you have hit them on their softest spot and it will take them some time to recover. They will come around eventually...they have to or else they run the risk of being irrelevant.